After a very long graduate class, my husband and I drove down to Syracuse to celebrate Imbolc with my grovies at Muin Mound Grove. I was delighted to make at least half of the business meeting*. Since I wasn’t able to make the Winter Solstice gathering, I was extra glad to see everyone yesterday. Candee generously brought wheat so everyone could make his or her own cros-Bríde or Brighid’s cross. At left is a photograph of the one I made this year. I hung it on our front door for the celebration. 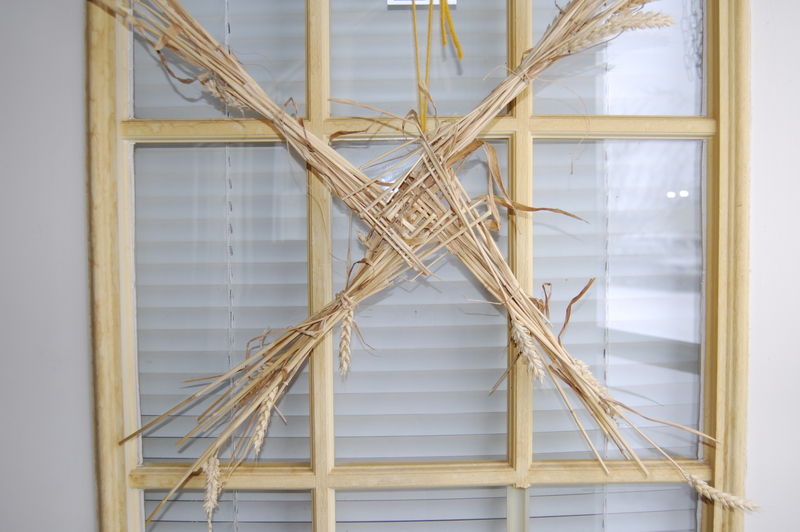 After Imbolc is over, I will trim the arms a bit and hang it over my door as a protective charm. I have one in my kitchen as well which acts as a protective charm against fire. Someone in the grove made one which, during ritual, was passed around from person to person. We made wishes to Brighid prior to placing it before a statue of the Goddess. You can see a photo of that below and at right. I apologize for the poor quality (even though I think it has a nice ethereal feel to it) but better pictures are coming! I was also pleased to see my witchy friends from Utica. A couple circles ago, we discussed what to do for Imbolc and, as there was a question of whether or not our high priestess/circle organizer would be around, I invited everyone to Muin Mound. After all, though celebrations of spring are prominent throughout the world, Imbolc itself is traditionally a Celtic holiday. Why not invite people to get a Druidic taste of the day? Six people from Utica came and I was so happy to see them. They seemed to enjoy the ritual and I hope they got something out of it! We had the ritual outside. It wasn’t as cold as it was last year, but I came prepared anyway! I wore two pairs of socks, a more appropriate pair of boots, knit tights under my jeans, a winter coat, and a cloak. I was toasty everywhere except for my toes! I may follow Candee’s lead next year and find some foot warmers! 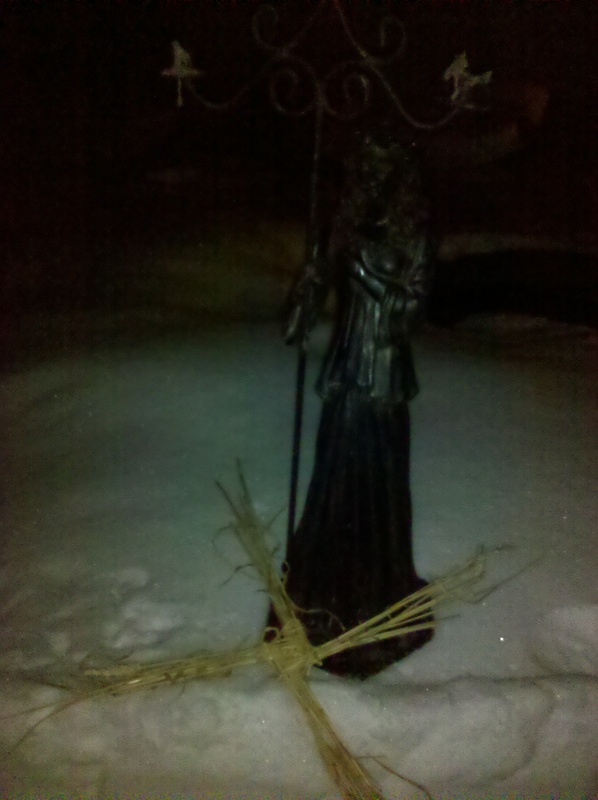 I’m very glad my grove decided not to be a bunch of fair weather Pagans and celebrate Imbolc inside. Being out in the elements is a really powerful reminder of how blessed we are to have fire and warmth. Every time a vial of oil or a glass of alcohol was poured into the flame, I sensed Brighid’s power and blessings. The grove is doing something a little different than before. Willow has taken on the role of sacrificer. This started a few rituals ago, but it has transitioned into something more organized now. She takes care of the offerings while the rest of us concentrate on the words. I think it’s a nice way to organize public rituals because it keeps everything flowing and removes a lot of uncertainty, especially for people just coming out of their shells. The omens were good. The kindreds spoke of a strengthening, growing community and new beginnings. With visitors from Utica, two new prospective members, and two additional people who want to become folk of the grove, I’d say Muin Mound is doing well! 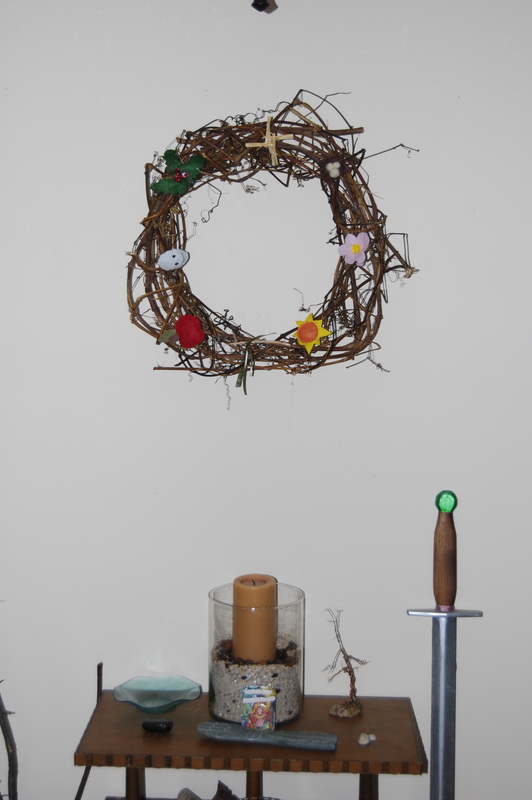 Along with everything above, I was able to assemble my Wheel of the Year Wreath. Willow was kind enough to make me a miniature Brighid cross to represent Imbolc. I’m very excited with the wreath and its purpose. I made a spot in the living room for a seasonal, family altar. I will undoubtedly make changes to it, and I will probably add more to my wreath, but it’s a start! * I’m already looking forward to the Spring Equinox! We’re planning to start making tabards and have a decorated egg contest! What fun! I love my grove.